Kerith Spicknall: I’m a dermatologist and also a skin pathologist. Debbie is a nationally recognized expert in skin lymphoma. Debra Breneman: About two years ago Bill Barrett, of the Barrett Cancer Center, asked if I’d consider starting a cutaneous lymphoma group. Cutaneous lymphoma is a disease treated by both dermatologists and radiation oncologists. Lymphoma presenting in the skin often acts entirely differently than if it presents somewhere else. Kerith had an interest and there are two oncologists at UC who are very interested in the field, so everything came together. It gives patients top-notch care when they can have different specialists all in the same place. KS: When people say lymphoma, typically they think, cancer in the lymph node. Broadly, cutaneous lymphoma is a cancer of white blood cells that starts in the skin and can go other places. It’s different than other forms of skin cancer—it’s not sun-induced, it’s not melanoma. We don’t know what causes it. For many people it is [a lifelong disease]. For some people it’s a cancer that does progress. DB: It can imitate many other skin conditions and be very easily mis-diagnosed—anywhere from eczema to psoriasis to more esoteric skin conditions. The rare forms can be difficult to differentiate. There is so much specificity to what you need to know and the field is changing constantly. Unless you really have a deep understanding of cutaneous lymphoma, there’s a very good chance you’ll miss the nuances that make a difference in the best way to treat patients. KS: In patients who have early stage disease we use skin-directed therapies—topical treatments or ultraviolet light. As a patient advances to a higher stage—the white blood cells are not just in the very superficial part of the skin, or the blood might now be involved, or a lymph node—we think about systemic treatments: pills or injections or photopheresis, [where] blood is circulated through a machine, treated, and infused back into the patient. 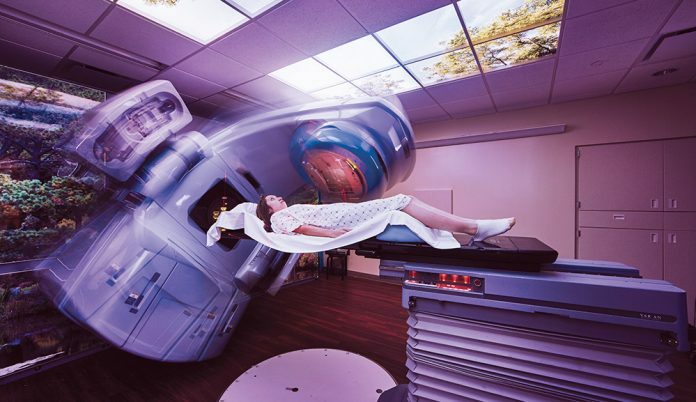 We’re the only center in Cincinnati that offers a specific modality of radiation treatment called total skin electron beam therapy. DB: Treating cutaneous lymphoma is as much of an art as it is a science. Most treatments aren’t even approved—a lot are off-label. In this disorder you do a lot of thinking of ways that you can improve life for patients, because standard treatments might not work. The focus of the clinic is in delivering the best care possible to these patients.